Smartphone Sales on Day 74 - Motorola Droid the Winner! Discussion in 'Android News' started by danDroid, Mar 16, 2010. A new report out today from analytics firm Flurry indicates that the Motorola Droid has outsold the Apple iPhone in the first 74 days of sales. Verizon and Motorola did everything right with the Droid. The launch was set just before the busy holiday season, the marketing was outstanding, Verizon customers where hungry for a new powerful smart phone, and the price tag was spot on. As expected Google's Nexus One is trailing far behind with nearly 135,000 units sold. Through applications using Flurry for analytics reporting, Flurry can detect and count unique devices in the market such as Google Nexus One and Motorola Droids. Because applications embedded with Flurry have been downloaded to over 80% of all iPhone OS and Android devices, Flurry is able to make reliable estimates about total handset sales. hehe.... gotta love those stats... and a very big reason why apple is ****ting it's pants and starting a lawsuit. Gotta love it!! I heart MY DROID!! Steve and his precious iPhone. He had better come on with It if he wants to top the Droid.I bet he has crap his pants more than once. Edit button isnt showing up again. This is all great but where is 2.1? Take that apple. Your going down! Called to order mine and the rep told me to wait till after April 1 and they should come with 2.1 installed. We will have to see if it is true. Um.....Thursday....But it wouldn't surprise me if you are disappointed with it. 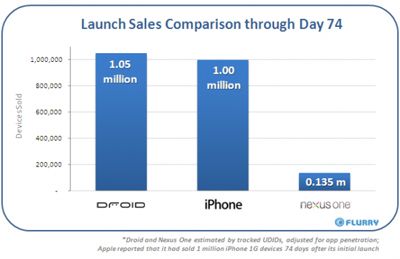 I think its awesome that droid outsold the iphone. I am curious as to why its based on 74 days though. Whats the significance of '74'?